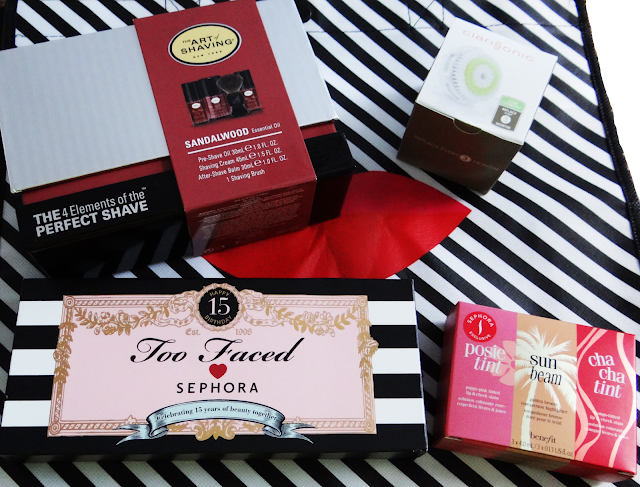 Sephora VIB Sale 2013 Haul! I was super excited for the VIB 20% sale. I qualified for VIB about two weeks before the sale so this was my first time being able to be part of it. Surprisingly I didn't have much on my list of what I wanted. I only needed more brush heads for my Clarisonic. I wanted the delicate brush heads since I had the normal and it breaks me out a bit. They were sold out of the delicate brush head so I got the acne ones since I read reviews saying the acne one was similar to the delicate brushes. I had to spend $75 or over to qualify for free shipping so I ended up asking my husband and sister if they wanted anything. My husband got The Art of Shaving - The four elements to a perfect shave in the scent Sandalwood. My sister wanted to try out some blushes so she got Benefit's Gettin' Cheeky set. I was about to checkout when I saw the Too Faced Loves Sephora palette. I started looking at reviews and wanted it so bad. (I know.. I don't need anymore palettes but it's so beautiful!). I got some samples with my purchase, I decided to get primer samples and some perfumes. Part of the VIB sale with every purchase you get a tote bag. After placing my order online. I did make a purchase in stores during the VIB sale where I picked up the Sephora Favorites - Glitz & Glam bag for my sister as her early christmas present. I'll be putting up individual reviews of each of the products, so watch out for those!